Central air conditioners are “split systems”, which means they consist of an outdoor (condensing) unit and an indoor (evaporator) unit. Both components are necessary for a working system. The air conditioner is designed to transport heat out of your home using a refrigerant. Air from your home passes through an indoor coil mounted in your furnace. Heat is absorbed from the indoor air and the resulting cooler air is then circulated back into your home through your duct system. The heat from your home is extracted and released through the outdoor coil. While it’s keeping you cool, your air conditioner also is effective at removing humidity from your indoor air. The process is similar to moisture condensing on the outside of a glass of ice water on a hot, humid day. If you install a new outdoor unit, be sure to include a new, equally efficient “matched” indoor coil. Using an existing “old” indoor coil may save you money up front, but won’t give you the best value. Although it may still work, it will not perform as efficiently and over time will cost you more money. Also, if the components aren’t matched, additional stress on your cooling system may shorten the life of your equipment. Hovland’s and Lennox have a reputation for quality and reliability that can save you headaches and extra expense down the road. Lennox is recognized in the industry for its state-of-the-art research and development laboratories and is certified as an official test site for the American Gas Association. Lennox product continuously undergoes extensive lifecycle and field-testing procedures to insure manufacturing excellence. Almost every Lennox air conditioner we sell includes a 5 or 10-Year Limited Lifetime Warranty on the compressor (primary component of the outdoor unit) and a minimum 5-Year Limited Warranty on parts. Hovland’s is pleased to offer dependable and efficient products from Lennox. The Seasonal Energy Efficiency Ratio (SEER) is the method used to rate the efficiency of your air conditioner. The higher the SEER the more efficient it is. Every SEER represents approximately 6% savings on your electrical usage. 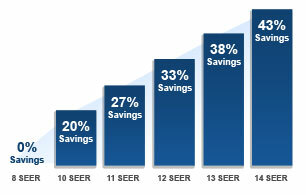 So when you upgrade from a 10 to a 14 SEER unit you can save up to an additional 23% on your electrical usage. In January 2006 the U.S. Government increased the minimum SEER rating to 13. With this in mind, customers should determine if the cost of upgrading versus the savings anticipated makes sense for their situation. In most applications, it does! If your existing unit is still functional and the time value of money is considered, most often retaining your existing equipment is more cost effective than proactively replacing it. However, regular maintenance should be performed to keep your unit operating as efficiently as possible. Hovland’s offers a full line of Lennox air conditioning equipment that uses the chlorine-free R410a refrigerant. This refrigerant meets the U.S. Environmental Protection Agency’s (EPA) newest, most stringent environmental guidelines. For more than four decades a refrigerant known as R-22 has been used almost exclusively in residential air conditioning systems. R-22 is an HCFC (hydrochlorofluorocarbon), which contains ozone-depleting chlorine. It is also a greenhouse gas and the manufacturing process results in a by-product (HFC-23) that contributes significantly to global warming. The production of R-22 is being phased out over the coming years as part of an international agreement to end production of HCFCs. As a result, manufacturers of residential air conditioning systems are now offering equipment that uses a newer R410a refrigerant – a more environmentally-friendly alternative to R-22. After January 1, 2010 chemical manufacturers may still produce R-22 to service existing equipment, but not for use in new equipment. After January 1, 2020 chemical manufacturers will no longer be able to produce R-22. Use of existing refrigerant, including that recovered and recycled, will still be allowed to service existing systems. It is important to note that existing units using R-22 can continue to be serviced with R-22. There is no EPA requirement to replace units or convert R-22 units for use with a non-ozone-depleting refrigerant. Therefore, if a leak develops in your R-22 system, after repairing the leak our technicians will continue to charge R-22 into the system. Although R-22 can no longer be produced after 2020, it is expected to be available for the next 15 years or more from remaining supplies, reclamation and recycling. It is reasonable to expect however, that the price of R-22 may increase as supplies dwindle over the next 20-30 years. 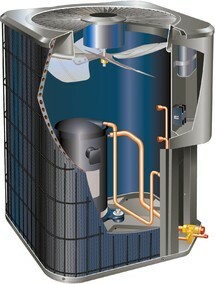 Usually, the higher the efficiency, the more expensive the inital cost of the unit. Since we live in the Midwest where our cooling demand is considerably lower than in southern states, it is sometimes difficult to justify the higher cost of the most efficient air conditioners on the market. The incremental cost will take longer to recover since the energy savings are only recognized during the summer months. It is important to consider however, that air conditioning units typically last longer in our area, because they are only used during limited months during the year. Over the life of the unit, energy savings from a more efficient unit can be significant. The professionals at Hovland’s will be happy to recommend an air conditioning unit that will provide the best value for our climate.